Fortunately, author Chris Adrian is a masterful storyteller who seems to relish the original text as much as I do, and highlights, then subverts or enhances elements of that first tale. The fairies are of the primitive, undainty sort that more commonly populate our earliest fairytales, as likely to do terrible, unknowing wrongs as to grant wishes. Puck is particularly fearsome, Titania’s morals utterly fluid and often suspect, and nothing is ever what it seems for more than the most fleeting of moments. In Adrian’s reimagining, the action all takes place in and under the hills of San Francisco’s Buena Vista park on the night of the summer solstice, in the aftermath of a tragedy that created a rift between Oberson and Titania, and drove Oberon out into the world. Titania has been mourning his loss ever since, giving credence to the idea that she would behave so dangerously and foolishly as to release their greatest foe from the spell that binds him from causing harm. Occasionally it’s difficult to keep the characters separate – some (especially among the fairies) have names that I felt suited others better (Oak, for example, rather than being the one that resembles a tree, is the one that seems to be half-bunny, half-boy), but that only adds to the appealingly disorientating feel of the tale, as we flick in and out of the mortals’ memories and their experience under the hill, trying to escape the wrath of the ravenous Puck. Chris Adrian was named by the New Yorker as one of the best young writers in America, and the honour seems well placed. The Great Night will transport you, enchant you, consume you, and you may well emerge transformed. 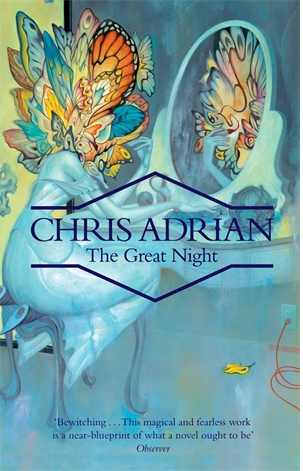 The Great Night by Chris Adrian is published by Granta Books and is available from Amazon. This entry was posted in Reviews and tagged Book reviews, Chris Adrian, Granta Books, The Great Night by Judy. Bookmark the permalink.